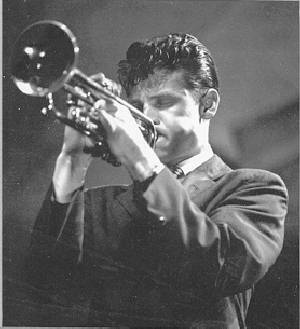 Chet Baker was born in Oklahoma in 1929. He never learned to read music, but he got his training in army bands. After being discharged from the service, he moved to Los Angeles and beat out all the locals in an audition to play on tour with Charlie Parker. Then, he hooked up with Gerry Mulligan in a quartet that made a distinctive mark in the 1950s by not using a piano. An early recording of My Funny Valentine by the quartet shot Baker into the national spotlight and made the groups' sound and look (especially Baker's) synonymous with the "cool" attitude. Baker had a sound that resembled Miles Davis' without the emotional undercurrents, and his style resembled that of Bix Beiderbecke. I really like his sound -- both his trumpet and his singing -- he was the classic "crooner." While he is associated with the "cool" label, he could play with hardest boppers, as he demonstrated in the late 1950s. 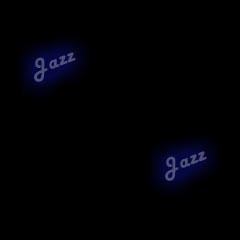 In 1953, Baker began recording and performing with pianist Russ Freeman, and he established himself as a major jazz star. Outside of his pure, open trumpet tone, Baker was a romantic singer with James Dean-like looks and had a reputation for high living, all of which helped his star stature. However, the growing frequency of drug incidents began overshadowing his playing in the mid-to-late Fifties. He moved to Europe, where he hoped to pursue a film career also, but he was imprisoned for drug problems in Italy, which set him on his itinerant lifestyle that he would live for the next 25 years. He returned to the states in 1964 and recorded with George Coleman and Kirk Lightsey. In 1968, he lost his teeth in a fight with other junkies in San Francisco, and his career appeared to be over. However, he resurfaced in New York in 1973 and renewed his recording career. He spent much of his final decade in Europe. He recorded far more than most jazz musicians during the 1980s, because he always needed money to support his drug habit. Baker was the subject of a film called Let's Get Lost, a story of hero-worship and self destruction. Chet Baker died in 1988 under mysterious circumstances, as he fell out of a hotel window in Amsterdam.